If you’re just now getting your arms around collaborative robotics, buckle up—it’s going to be a wild ride into the next generation of automation. That was one of the take aways from a panel discussion on collaborative robotics at the Advanced Design & Manufacturing (AD&M) expo in Toronto this week. “Collaborative robotics is a big deal,” said Nick McDonald from ABB Robotics, “but it is the beginning of the next big thing.” It won’t be a pocket-on-the-shirt type of innovation, either, he added. “That’s handy, but we’re looking at something much bigger.” What that something might look like or do, however, was the subject of some speculation. Will it be cobots going mobile? Moderator Jim Beretta from event organizer UBM put that idea out there, citing Clearpath (Kitchener, ON), which has developed self-driving vehicles for material handling and transport in production environments. PlasticsToday recently reported about the vehicles’ use at GE Healthcare’s massive Repair Operations Center in Milwaukee, WI. And just today, industrial automation company Comau (Turin, Italy) announced the launch of an automated guided vehicle platform that, it says, can facilitate core operations including just-in-time and just-in-sequence production, as well as optimized logistic flows inside the factory. The Agile1500 platform has a platform system management software that handles transport orders, allocates vehicles and monitors the entire fleet. So, you have to ask, what if we put a cobot in the driver’s seat and eliminated any human involvement in the loading and unloading of parts? Power supply is a big obstacle, noted McDonald, adding that it “is an application waiting for its time.” Panel participant Yarek Niedbala of Kuka Robotics noted that his company has a mobile platform for aerospace applications, so it can be done, but in specific applications. Niedbala also pointed to a surge in interest from the foodservice industry. The application is not new, but it is gaining tremendous traction and has fast food personnel nervous. 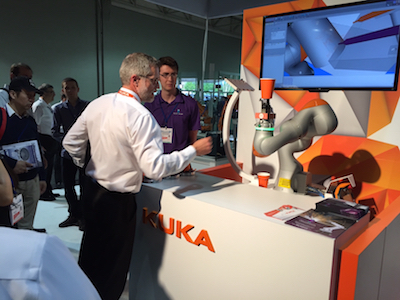 Maybe baristas also should be looking over their shoulders: On the ADM show floor, robotics company Kuka displayed one of its robots that was preparing coffee (although it did have a few bugs). All three panelists agreed that collaborative robotics 2.0 will be characterized by more sensors and cameras that will endow cobots with greater cognitive capabilities as well as self-programming features. For instance, teaching robots via hand guiding was a welcome advance in automation technology in recent years—the next generation will teach itself.